This morning I was reading Trail Runner magazine's trail shoe review and decided, that's it - I'm going to run on a trail today. Although it was early, I wasn't sure whether Stillwell's lot would be packed with cars, due to the dozens of soccer games that are played there on Sunday. I was also concerned about taking on too much technical terrain after yesterday's basketball hoop assembly. I seemed to have avoided damage from putting so much pressure on my lower back yesterday, although I felt slight discomfort in my upper hamstring during today's run. It was nothing that would limit me, more like a message from my body reminding me to be more careful. 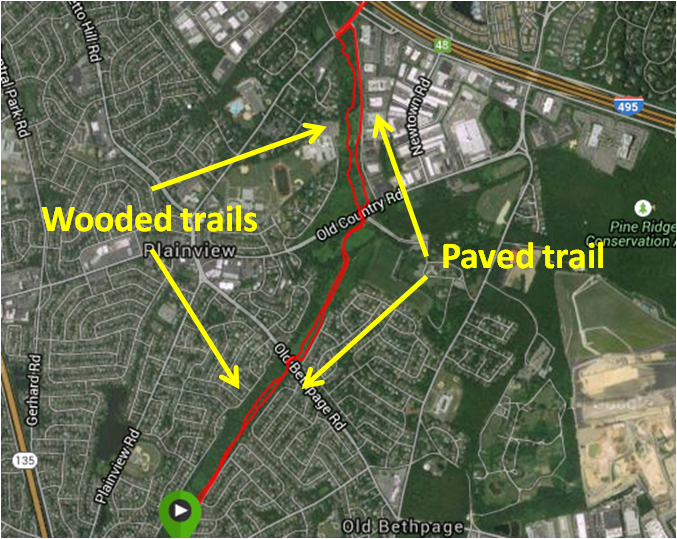 Since I wasn't looking to do a full trail run this morning, a hybrid of trail and pavement would be a good combination. The best place I could think of to do that was the Bethpage trail just north of the park. I headed over to Runsketeer base camp (sadly with no other Runsketeers today) to park near Haypath Road. I quickly got a signal on my Garmin and ran over to the eastern trail head off of Haypath to begin the first half of my run. The dirt trail parallels the paved bike path, but it feels like you're in the middle of the woods most of the time. The path is largely straight and it reminded me of Trailview in that respect. But Trailview is more technical, while this trail was mostly packed dirt. I encountered some gnarly roots that jolted me momentarily, but I didn't come close to actually tripping. I followed the dirt trails all the way to Washington Ave., jumping over to the bike path only to cross Old Bethpage and Old Country roads. Once on Washington, I ran to the 495 underpass that leads to the part of the bike trail that runs parallel to the Sunnyside Boulevard exit. I turned around at that point and followed the bike trail back. 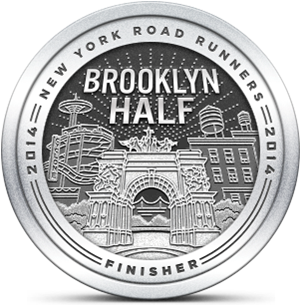 There were lots of cyclists and walkers on the path, but not that many runners. I encountered some trail bikers on the wooded path. They appreciated that I moved over for them and each rider told me how many others were behind them as they passed by from the opposite direction. On my way back, I ran into perfect conditions for an accident. A group of women walking together (and blocking most of the bike trail) were 20 feet ahead of me. I saw two cyclists heading toward them at a high rate of speed and another biker coming up from behind. I could tell the single biker planned to thread the needle to the left of the women. What he couldn't see because of the curve of the trail, were the two other cyclists who were planning to pass through the same gap from the other side. The Pauli Exclusion Principle states that no two identical particles can occupy the same space at the same time. I expected to see that theorem tangibly proven all over the Bethpage trail. Through some miracle, the two riders coming from the south got through about ten seconds before the rider who was behind me got there. I was astounded by this. The women were blissfully unaware that they came very close to becoming a 7-10 human split. The rest of my run was happily drama free. I completed five miles, satisfied that I got in some good trail time. With Wednesday's elliptical session and three decent runs, I'm pleased with my progress this week. I'll aim for another weekday workout next week, perhaps an afternoon neighborhood run. There aren't that may spring days left and I'd like to take advantage of them as much as I can. Just bought a bike because I'm injured yet again (stress fracture). I will not bike on the roads of Long Island as I prefer not to get killed. It's dangerous enough to run out there, much less bike. How early do you have to get to bethpage on a weekend to avoid crowds on the path? Thanks. Sorry to hear about your stress fracture. Hopefully recovery for that is measured in weeks. Like you, I would not bike on LI roads because of the high percentage of texting, phoning, drinking and aggressive drivers. Same for running. I won't even cross Jericho Turnpike at lights because I have zero trust in these drivers. The Bethpage trail is generally pretty quiet before 7:00 AM. I started just before 8:00 AM today and didn't encounter many people until about 8:30 when suddenly everyone seemed to show up. 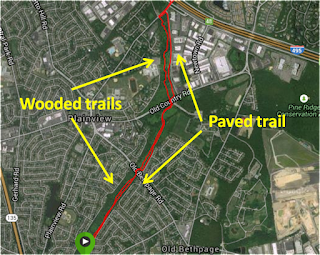 The bike trail is a great alternative for runners and bikers, although you do need to cross Old Country Rd, Old Bethpage Rd and Haypath Rd north of the park. South of the park, there's not many places where cars come through until Linden St. leading into the Massapequa Preserve. I don't think it's that crowded later in the day. There are people, but it's not like the Highline. It's almost like you're boasting when you go on and on about not tripping on roots. There's nothing wrong with eating a little dirt on occasion. It's good for the digestive system. I was too polite to mention it in my post, but I did run by the spot where you face planted during the GLIRC run. Notably, I didn't trip there on that day. Like you did. Splat. But like I said, I'm too polite to say anything about that.